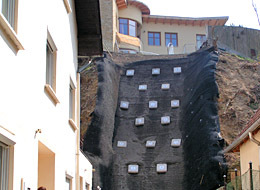 By slope anchoring stabilization using rigid steel casing (soil nailing) very steep slope surfaces can be created, and in some cases retaining walls may be omitted. Stabilization using rigid steel casing is a very cost effective solution for the wall support of large construction pits, executed simultaneously with the earthworks (may be applied even instead of sheet piles or diaphragm walls). Gravel slope stabilization above clayey layers under groundwater is also possible by anchor stabilization using rigid steel casing, combined with woven geotextile surface protection. 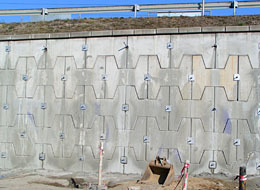 In case of reinforcement or safety enhancement of retaining walls, pile sheet walls or diaphragm walls with insufficient load-bearing capacities or already moving. Installation in indoor areas, as quickly set micropiles with tensile and compressive strength. Anchors with rigid steel casing can be drilled through masonry structures made of stones, bricks, monolithic concrete or reinforced concrete, and can be fixed by injection in order to create a composite structure. In case of quick execution, if necessary, anchors can be loaded even within 24 hours. Anchors are made using a drilling stand mounted on a hydraulic excavator, thus, the technology can be easily adopted to the installation conditions (e.g. anchors can be executed up to a height of 6 m without complementary scaffolding). Anchor rods are thread-ribbed rebars made with an internal injection borehole, which are used as drilling bits during drilling and as non-retrieved rigid casing in their final positions. The non-retrievable drilling head, selected according to the different soil or rock characteristics, is mounted on the first thread-ribbed drilling bit. On the drilling head, there are injection holes. 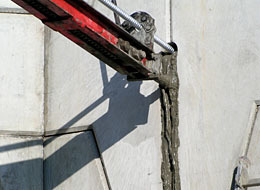 Anchor drilling is performed with thin cement slurry injection. Cement slurry is injected to the drilling head through the longitudinal borehole in the core of the drilling bit, from where it flows into the drilling section around the drilling bit through the injection boreholes. The pressurized thin cement slurry leaving the drilling head will extract the soil/rock cut by the drilling head through the annular gap created around the drilling bits, while ensures cementation of the soil in the whole drilling area. The extent of this cementation depends on the gap ratio of the surrounding soil. 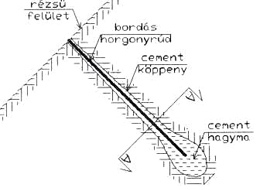 After reaching the desired bore length/anchor length, closing injection shall be made using thick cement slurry. This thick cement slurry will set around to drilling bit, creating a cement stone body, which participates in the load-bearing and protects the rebar core used as drilling bit from corrosion. Using the above described process, an anchor of 12 m can be installed in a very short time (0.5-2.0 hours) in soils of excavation class II-IV, which can be loaded after a few days of setting as necessary.